Bringing a live Christmas tree into the house sounds like a good idea — it turns an expense into an investment — but because most of the eligible candidates eventually become quite large, the first consideration should be whether your yard actually has a need or even the space for a towering conifer. There is nothing quite so awkward or destructive to the garden space as a spruce or fir grown out of scale. Once the decision to go forward has been made, however, there are still several things to consider. It is a good idea to dig the hole where the tree will eventually be planted before the ground freezes. At The Victory Garden, in our Zone 6 climate, around Thanksgiving is a safe bet. The hole should be plenty big enough to accommodate the root ball. I like to fill a plastic trash bag with fallen leaves, which I place in the hole and then seal over with a piece of plywood. This will insulate the excavation and keep it from becoming a frozen pit. The soil removed should be kept in a place where it will not freeze either — it's important the soil remains workable so it can be used as backfill at planting time. 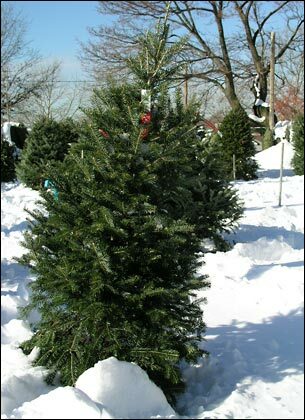 Unless you've got a crew to help, you'll probably want to choose a live tree of more modest size. Unless a crew of landscape help is at your command, it might be wise to choose a tree of more modest size than you are used to when choosing a harvested tree. Root balls can be amazingly heavy, and a large one will be more difficult to disguise in a living room setting. 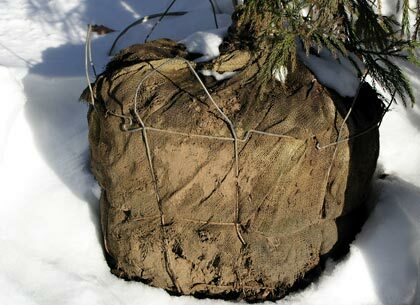 While the tree is waiting to be brought into the house, the root ball (whether balled-and-burlapped, or potted) should be protected from frost. Haul it in, or cover with a thick layer of mulch, leaves, etc. If you have a cool room in the house, this would be the best place to set up your Christmas tree. Spraying the needles with an anti-desiccant is advisable, and the roots should be watered frequently. In any case, you can only keep the tree inside for one or two weeks. If the leaf buds break dormancy, the tree will likely not survive the winter cold when it is planted outside. The root ball adds a lot of extra weight — but it's vital if you plan to replant. 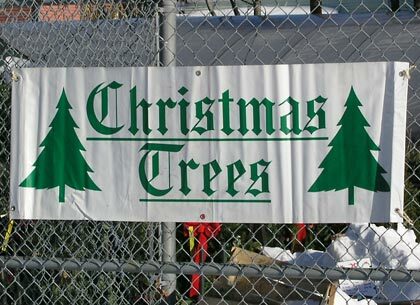 Here in the north, appropriate species include white spruce, Colorado blue spruce and Fraser fir. Further south, Leyland cypress and other species are often used. Consult your local nursery. When the tree leaves the house, it's not a bad idea to hold it in a cool garage for a couple of days to let it acclimate to the winter conditions it will face outside. When it's finally time to plant your Christmas tree outside, set the juncture of the trunk and root ball slightly (about 2 inches) above the existing grade to allow for settling. Backfill with the reserved soil and tamp out all the air pockets. Then water copiously and mulch. ... And have a happy New Year! Kip Anderson has been The Victory Garden's head gardener for over 15 years.